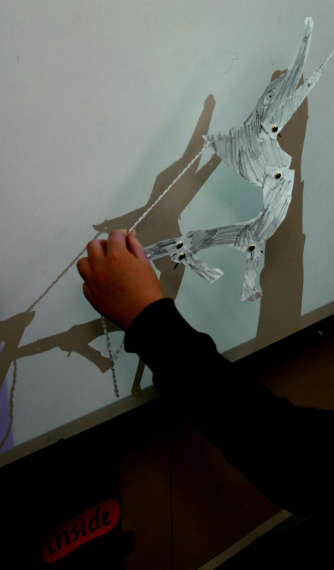 This project was Phase 2 of the Arts in Education Initiative – Exploring Teacher/Artist Partnership as a Model of CPD for Supporting & Enhancing Arts Education. The initiative comprises three phases and is being conducted using Action-Research methodology and principles. It is a Department of Education and Skills initiative developed in response to the objectives outlined in the Charter. 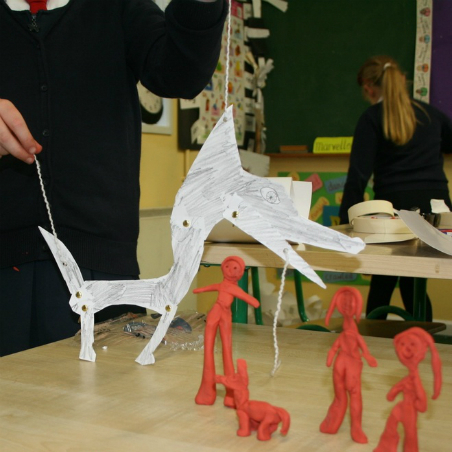 Vera McGrath (lead teacher) was nominated by Monaghan Education Centre and Claire Halpin (lead artist – visual artist) was nominated by the Irish Museum of Modern Art (IMMA). From the outset we wanted the project to be very open and to really explore the partnership of the artist and teacher in the classroom and allow the class group to inform the direction the project would take. We slowed down our working processes and took time to discuss our creative work as the project developed. Our opening theme was the idea of place – Where is your place? What does your place mean to you? 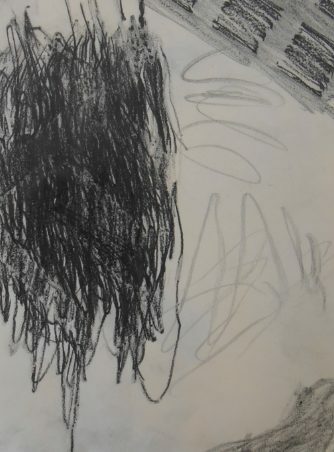 We began working in drawing – mapping our journeys to school and home, blind drawings and detailed maps, gathering textures from our surroundings our physical space, talking about natural and manmade spaces and surrounding sounds. We visited Parallel Visions: Sculpture and Installation from the IMMA Collection at the High Lanes Gallery, Drogheda. Vera led the tour using an enquiry based approach with the group – What do you see? What do you see that makes you say that? It allowed the group to really explore the work and discuss its physical qualities, how it was made as well as the themes and ideas in the artworks. Following on from this in the classroom, we explored paper as a construction material. We punctured, twisted, rolled, pleated, bent, folded, shaped, cut, adhered, fringed, knotted, crushed, scrunched, pinned, threaded, stapled, stuck, tore, layered, decorated and plaited different papers to test out how strong durable, sturdy, weight bearing and appropriate different weights, graded and textures of paper were for the creations that the participants undertook. Over the next few weeks the group developed on these techniques and planned artworks that would reflect the idea of place – where is your special place? As the plans developed we evaluated the ideas and themes in group critique sessions. We talked about where these art works would be placed in the real world – context and scale. We looked at other artist work discussing scale and space. All the time developing the groups language skills in discussing art and critical thinking and critical reflection. In keeping the emphasis on the openness of the project we allowed the group to select whatever materials they would like to work with and developed their techniques and creative processes and potential in working with these materials to create their artworks. We worked on these pieces over a number of weeks as the group explored and learned the techniques of the materials they had selected to work with and refined and developed their individual artworks. The group’s creativity, imagination and hard work was overwhelming. The individuality of their work and their articulation of their work and their individual creative processes was incredible. 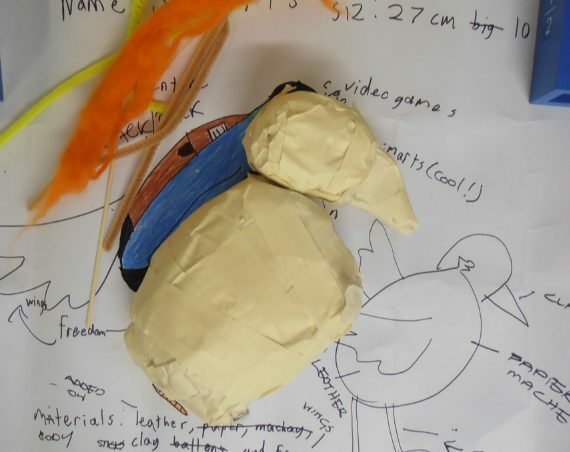 They were really focused and concentrated on the project, had a strong sense of ownership of the project and developed confidence in their skills and creativity. It was a new experience for them to work in this way, and they were challenged by this approach as they are more accustomed to direct instructions and making specific artworks. I feel the trust of myself and Vera in the partnership, in each other and in the group allowed for these outcomes to emerge. We worked very well together – each taking a lead where appropriate and relevant and within this learned a lot about each other’s working processes and language around discussing art and our own individual approaches and practice. The project entailed a lot of planning on a weekly basis and also each week we would spend time evaluating and working out where to go next with the group, analysing their responses to each session. The group was unique in that they were a newly-formed group for the project, comprising 13 children from learning support, encompassing a spectrum of students with different needs including the academically gifted, dyslexic/ dyspraxic students and students in the autistic spectrum. Being a small group, we were afforded the luxury of allowing the children to work in their chosen medium. This was challenging for us time-wise as we had to teach each child the practical skills and techniques of working in their chosen material. It also allowed us as teacher and artist to take chances with the project and try out this approach and to develop a trust in each other and the group. In so doing, the group could see that we did not always know the answers but would figure it out, which is inherent to creativity and being an artist. 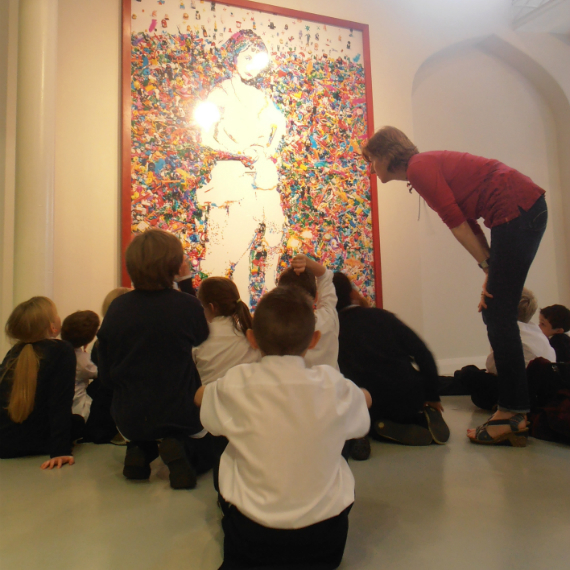 This I feel allowed the children to see themselves as artists creating individual unique artworks that were personal to them. A key part of this was the regular group discussions evaluating their own work and the creative processes of the project. I learnt a huge amount about slowing down – really taking time to allow the artworks to develop and discussing these developments throughout. The enquiry-based approach to the exhibition visit for me was a learning curve around discussing artworks and how this approach creates really strong memories of the artworks and the experience of looking at art for the participants. These aspects are something that I will bring with me from the fantastic experience of working in this partnership project. The commitment to the project and the partnership from the teacher and the class group was critical to the process and made it a really strong project, allowing for the positive creative outcomes and learning experience. I concur with all the observations made by Claire above. I was very excited and amazed by the ability of these young students to articulate their ideas and how creative they were in their approach to realising them through visual art materials. The whole experience created a wonderful bond among us all, myself Claire and the children, all of whom I now see in a different light. Thus the partnership blossomed from being a teacher-artist partnership to being a children/ artist/ teacher venture during which roles were interchanged regularly. Often Claire and I had to be so open to learning from and about the children with whom we were working. The process was wonderfully experimental, and Claire and I allowed the direction of the project to emerge rather than plan it rigidly from start to finish. We de-emphasised the finished product and kept our focus entirely on process, regularly gathering the children around to reflect on how they were progressing and what thoughts, insights and understandings were emerging. Like Claire, I found the greatest challenge for me was time management, particularly as we gave full reign to the students in the selection of materials for their final piece. I also learned to slow down- to give the process the time it needs and deserves and to recognise the value of doing this, something which often escapes teachers pressurised by meeting targets, expectations and completing curricula and governed by timetables. Personally I learned so much from Claire who brought the outside world into our classroom and taught me to think beyond and above the classroom, the school and the curriculum. The link to our website posted below is critical to get a flavour of the nature of this project. 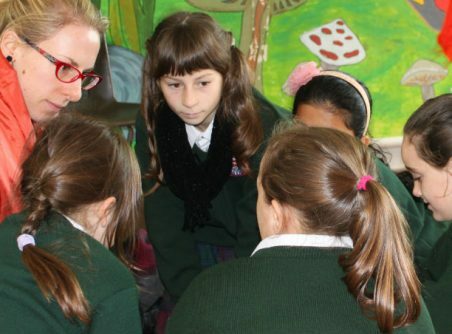 The learning outcomesof the work done by Claire and myself in partnership will now be translated into two summer courses to be run in Summer 2015for primary teachers and artists from different disciplines in two venues in the North-East and North-Dublin regions. Claire and I will lead these courses and bring the rich learning and insights we have gained to help nurture new partnerships between artists and teachers so that many more of the children in our primary schools can enjoy and benefit from the privilege of working in such a holistic, creative, intellectual, self-motivated and engaging manner. Moreover we hope that primary teachers will come to understand, as we now do the value of working in this way and that artists in our communities will see the wonderful insights, knowledge and skills they have to offer the world of education and how much they have to gain in becoming involved. 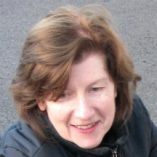 Claire Halpinis a visual artist, curator and facilitator based in Dublin and has exhibited extensively in solo and group exhibitions in Ireland and internationally. She was recently shortlisted for the prestigious Savills Art Prize at VUE 2018. 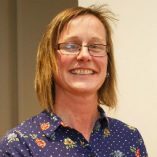 As a facilitator, Claire works with groups in a range of contexts including arts in education, museum, health, public art projects, community based projectsand is currently working on the DCC VTS Neighbourhood Schools Project. Facilitating workshops for over20years has afforded her valuable experience which she continually uses to evaluate and contribute to the ever unfolding process of creativity and development within collaborative and participatory projects and within her own artistic practice. Vera McGrath currently teaches half time in Scoil Náisiúnta Muire gan Smál Cartown, Termonfeckin Co Louth. She has her own art practice based mainly on drawing but is currently up-skilling in working with clay. She has been engaged in CPD for teachers in the Visual Arts since 2007 working in schools and Education Centres nationwide. She continues to give CPD courses based on Artist Teacher Partnership training. She joined the Artist Teacher Partnership initiative, the ATECI led Arts in Education programme in 2014, as one of the 6 original partner pairs piloting the research phase of the initiative. Her artist partner is Visual Artist Claire Halpin. She holds a B.Ed from NUI and a MAVA from NCAD. Thus the partnership blossomed from being a teacher-artist partnership to being a children/ artist/ teacher venture during which roles were interchanged regularly.